I have anonymized the original entry. To be fair, I did take the name you offered and ran an internet search. Needless to say, I cannot verify any information beyond that. That said…. You are doing what you need to be doing, and I think you already know that. If you are who you say you are, then you already know that you are a warrior and mystic both, and you take on challenges that others cannot or will not. Although I can understand this from what I have read on the internet (you are moderately famous in certain circles), your chart (which I ran first) confirms this. But, where to begin? You have a number of patterns in your chart, and patterns are my specialty. Other astrologers can speak to individual aspects or houses or progressions or whatever, but my strength is patterns and what they have been built from. That is what we will focus upon. Your patterns include: (1) T-Squares; (2) Grand Trines; (3) a Yod (a single Yod, a fundamental decision that you periodically re-evaluate in your life); (4) a Mystic Rectangle (probably both the source of your strength and the reason you just will not walk away from conflicts); and (5) probably the highest number of Kites I have ever seen in a natal chart. You also have a number of Grand Trines. You have so many that, if you did not have the numerous T-Squares, you might never get out of your chair. (Grand Trines are gifts, but they tend to make people very, very lazy.) Since these are fire trines, you can be inspirational, and you often motivate others to do your work for you. You have no trouble whatsoever delegating and sending others out on a mission. Mars is very important to Aries, and yours is at 26 Sadge. Sadge can be many things, including Universities and foreign travel. It is certainly religion (along with Pisces). Sadge is the sign of the Pope (metaphorically, not literally), and we would expect you to “get things done” by being a church leader. Mars is also the single planet in Sadge that completes ALL of your Grand Trines, making this relationship pivotally important. Sometimes it might behoove you to “just walk away.” Except, of course, that you cannot do that. Like Marty, that might ultimately be your downfall. Are there indications in his birth chart of these events? 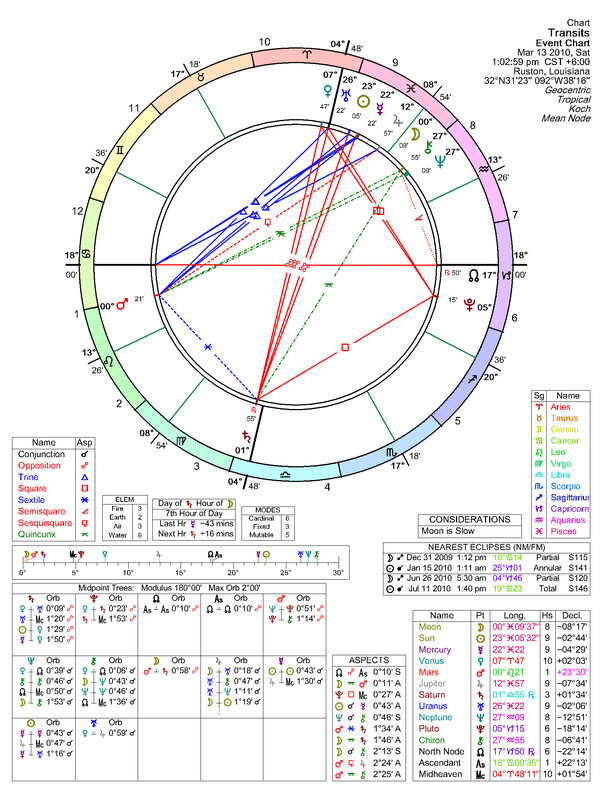 Ambulance called (outside) to attend to unconscious Lamar Odom (inside whee natal chart, sunrise, time unknown). 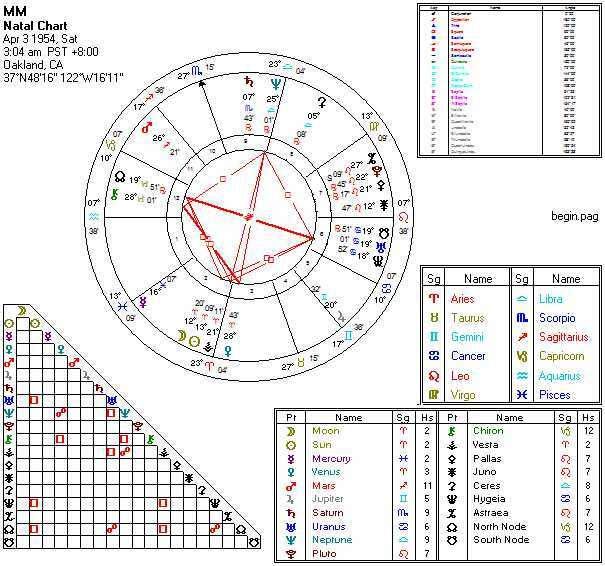 March 13th Yod and Midpoints: Which Man Should She Pick? 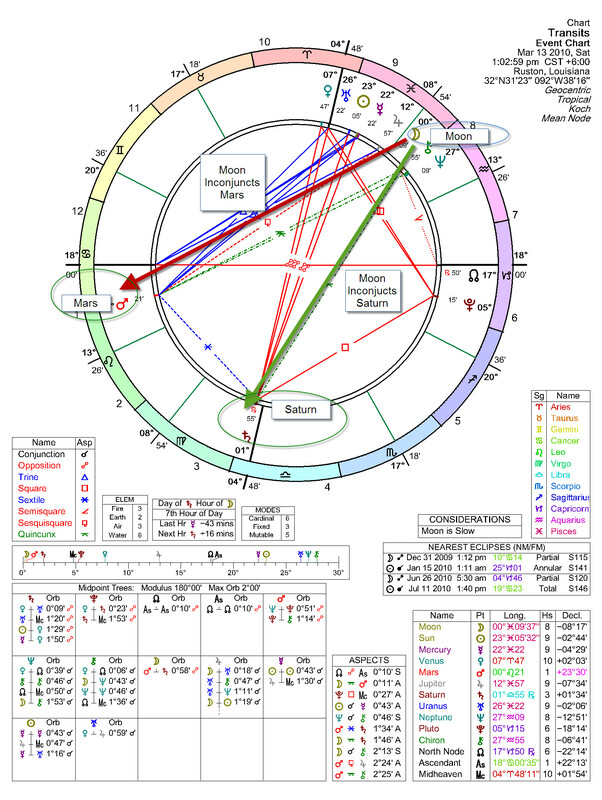 March 13, 2010 at 1:47 pm | Posted in Astrology, ExampleCharts, Predictions, Weekends | Comments Off on March 13th Yod and Midpoints: Which Man Should She Pick? I used the “Wheel and Data” page from Solar Fire to produce this chart. Although astrology charts address a number of issues, I am only going to address one particular issue here: certain women, tonight, will have to choose between one of two men. One man is young, handsome, and dashing. Well, I am not sure about handsome, and he might not be all that young. But, for many the chances are good that he is an athlete, a police officer, or a member of the military. He is the kind of guy who will defend your honor, and he will punch someone in the face to do it. He could be a sure bet, but he does have some downsides. He has a temper and might be violent. Sometimes he rushes in where others fear to tread. Based on his temper, he might hurt you. To be sure, he will say he is sorry afterwards, and he will charm you. But, this could easily become a very destructive pattern. The other man is probably older. He could be an authority figure, but probably not a police officer. He would be more like an attorney or perhaps a judge. He could be in the military, but he would be a seasoned leader, perhaps of the platoon. He could easily be a banker or business owner. He is stable, and he probably has money while everyone else does not during this recession. But he has his dark side as well. He may be developing problems: dental problems or baldness or other aspects of aging. You will always be in competition with his career or his business, and sometimes the business will win. You will feel like a neglected “business widow” or a “Trophy Wife” who must be perfect and greet the public to assure his position. He probably will not hit you, but sometimes he can seem mean. If you are a spender, then this is not the guy for you because he will be a penny pincher at heart. Violate the family budget and it could mean real trouble. If some of you (I am assuming the female readers and not the guys) are wondering if you will be satisfied with either one, let me assure you that you will not. No matter how WELL things work out, you will always WONDER what would have happened if you picked the other guy. If you pick the attorney / judge / corporate guru / Bill Gates (just kidding, Bill, we all know that you are, in fact, stunningly generous), then in your moments of boredom you will wonder what would have happened if you had picked “the exciting guy.” And, if you pick the exciting guy, you will wonder “why is this happening again” as he gets in yet another fight, this time with the guy turning off the cable because the bill was not paid. No matter which one you pick, you will always wonder. YOUR KARMA (Ladies) will be to COMPLETELY let go of the other “path” (guy). Failure to do so will bring you the worst possible result. How bad can it get? You’ll feel like a character in this Eric Roberts movie. This brings up another topic. Some of you ladies are cheating on your husband. He is the “Saturn Character” (older, possibly balding or dental, maybe a manager or business man). Well, this chart has maps (for beginners) to decode planets, signs, and aspects. 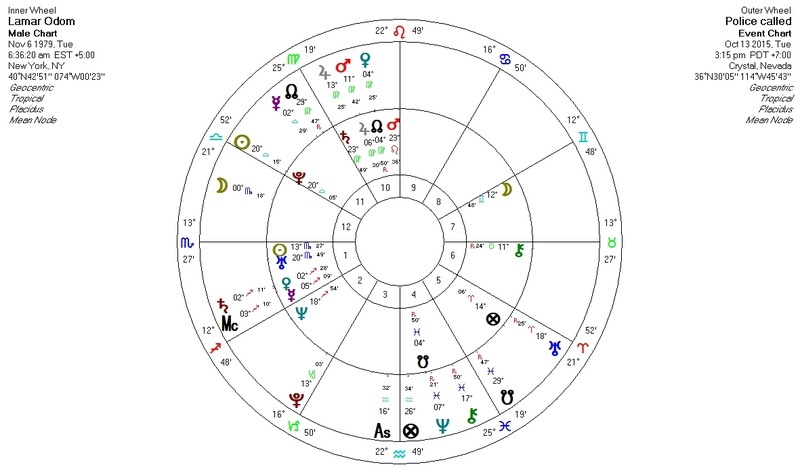 If you use the maps to decode the “Midpoints” section, you’ll find the following: (1) The Moon is in a relationship with the midpoint of Mars and Saturn (and, specifically, each of those is quincunx, forming a “yod” or a DECISION THAT MUST BE MADE); AND (2) Uranus (accidents, surprises, and unexpected events) is in a relationship with Venus (women) and Jupiter (the big amplifier that makes everything BIG). This latter aspect Uranus conjunct midpoint of Venus and Jupiter has several meanings. Some people will win BIG tonight. But, all three are in the sign of Pisces (revelations, self-undoing, and sometimes hidden enemies (that gossipy next door neighbor)). So, if you are cheating on hubby, chances are good that will be revealed tonight. AND, tonight he might have the energy to tell you to get out (if he is Saturn) or leave after he either beats you (Mars) or arrests you (also Mars). Tonight can be very, very bad news for women who are cheats. (Remember the Eric Roberts movie mentioned above? It is based on a true story, and that woman went to prison, convicted of murder.) Remember, also, this is a VERY old moon preceding a new moon (and that is about ENDINGS). Guys: I am leaving it up to you to discern who you are in this drama. Just realize that you may not be who you think you are. The police chief could be Saturn, and the business man might be Mars after all.